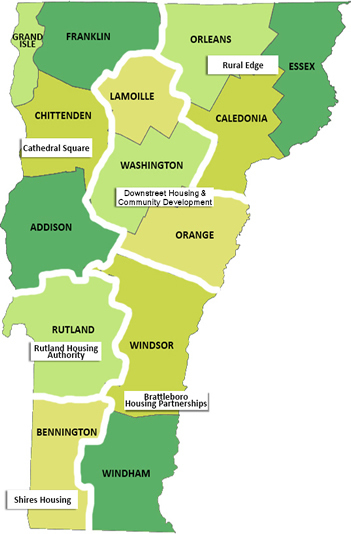 SASH is managed statewide by Cathedral Square with regional implementation led by 6 Designated Regional Housing Organizations (DRHOs) that collectively serve the state. In addition to Cathedral Square, the DRHOs include two Public Housing Authorities (PHAs) and three Community Housing Development Organizations (CHDOs). Additionaly, each DRHO region has a SASH Advisory Committee (Local Table) that meets regularly to provide support, expertise, guidance and general oversight of the SASH program to ensure excellence and integrity of the SASH model. Eash SASH Local Table is made up of representatives from regional organizations such as hospitals, Blueprint Medical Homes, Home Health Agencies, Area Agencies on Aging, United Way agencies, mental health agencies, social service organizations, colleges, religious groups, nursing homes, business organizations, advocacy groups, adult day programs and educational health programs and more. Please note: All direct lines for Cathedral Square office staff have changed. The phone numbers below are new and up-to-date. The Statewide SASH Support Team is available to answer your SASH related questions. Below is a list of who is on the SASH Team and some of their specialties. We are all willing to help you at any time. Email us at SASH@Cathedralsquare.org. This email address is a fast and easy way to send all your questions in to our support team. We review all emails regularly and make sure the best qualified person gets back to you in a timely manner. 802-859-8803 Partner relations, legal contracts, SASH model fidelity. Statewide operations and training oversight, SASH implementation and partner relationships. Health IT lead. Technical Assistance with program operations, team meeting support, regional SASH meetings, individual support and training. Serving Bennington, Lamoille, Orange, Rutland, Washington, Windham & Windsor counties. Technical Assistance with program operations, team meeting support, regional SASH meetings, individual support and training. Serving Chittenden, Addison, Franklin, Grand Isle, Caledonia, Essex and Orleans counties. 802-859-8816 SASH website, forum, success stories, SASH Beat, newsletter & brochures. 802-859-8817 Database/directories, referrals, trainings and webinars, SASH Forum. SASH statewide nursing support – training, individual and team support, clinical liaison. 802-859-8818 DocSite reporting, data analysis, iPad support, SASH IT support.